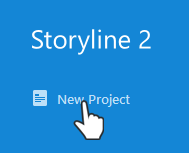 On the Storyline launch screen, click New Project. If you already have a Storyline project open, you can also go to the File tab on the ribbon and click New. Storyline will open a brand-new story with a single empty slide. Initially, you'll be in Story View, which gives you the high-level overview of your entire project. To edit individual slides, just double-click the slide thumbnail to switch to Slide View. You also have options to start a new project by recording a screencast or importing content from other sources. 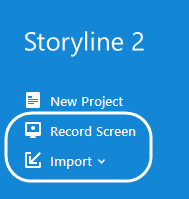 Just click Record Screen or Import on the Storyline launch screen. Go to the File tab on the ribbon and choose Save or Save As. To avoid unexpected behavior, save projects to your local hard drive (typically your C: drive). For more tips on managing your project files, see this tutorial. When you begin a new Storyline project from scratch, its size will default to 720 pixels wide by 540 pixels high. But you can change that, and now's the best time to do it—before you add any content. If you change the story size after adding content, some objects may need to be resized or rearranged. To change your story size, see Choosing a Story Size.